A family of five improvise together. Try to follow along. 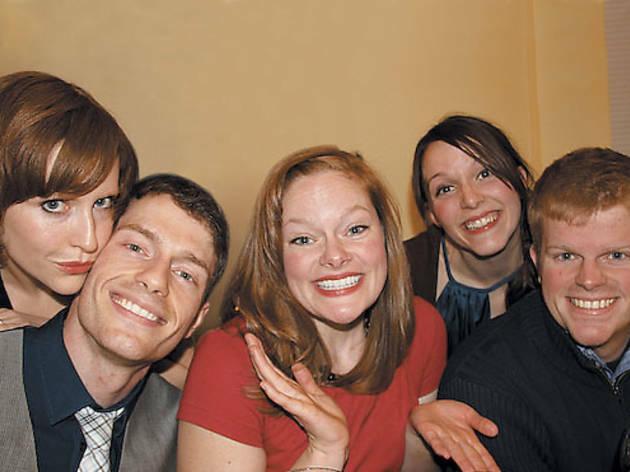 In December of 2001, Erica Elam moved to Chicago to pursue improv. In March of 2007, her youngest brother, Scott, followed. In August of that year, other brother Brett joined them. Brett fell in love with and is now engaged to his Level 1 instructor Jet Eveleth. Scott fell in love with and is now engaged to local improviser Lisa Burton. This month kicks off the debut of Dinner with the Elams, a new show happening Thursdays at iO, in which the newly formed family of five all play together for the first time. None of them have a clue how it will go. Got it? Talent runs in the Nashville-bred family. I recently sat down with the clan, sans Eveleth, and discovered that not only was their father a drummer for the inimitable Roy Orbison (he’s currently a manager for several artists), but their mother is a bit of a clown. “Our mom’s kind of a weirdo,” says Brett, who also is the sponsorship manager for country singer Kenny Chesney. “Every time we leave for a trip she runs out the front door and dances until we’re out of sight.” A middle brother, Matt, is a rapper turned comedian and screenwriter who still resides in Nashville. Locally, the family, plus fiancées, have racked up impressive credits. Scott plays with iO team Sears Tower and Second City’s Bench Co.; Brett performs with the much-hyped iO team Michael Pizza; Erica plays with Baby Wants Candy and has performed at Goodman and Steppenwolf; Burton plays with iO team Thank You Dr. Science; Eveleth plays with cult iO team the Reckoning and is considered by many—including this writer—to be among the city’s top improvisers. It remains to be seen what kind of scenes will emerge when the five play together. They’ve decided to keep the form loose. One week might be monologue-based like the Armando Diaz Experience on Mondays; other nights might burst into song or be a rapid succession of short scenes. “We’re just going to play really hard together and see what evolves,” Erica says. But familial relationships complicate matters. What happens when siblings are called upon to play husband and wife? The Elams aren’t worried. “I’ve tongue-kissed Scott onstage before,” says Brett, referring to a tag-out scene where they ended up locking lips. Likewise, Erica recalls her and Brett playing husband and wife during a Baby Wants Candy set. “Maybe those are just built-in cheap laughs that we have,” he says. 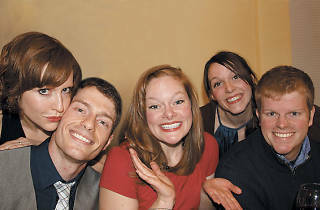 Dinner with the Elams happens Thursdays at 8pm at the iO Cabaret Theater.